Old signs have been a love of mine for a VERY long time. I mean… how about buffalo checked toolboxes?! Or on anything you wish! 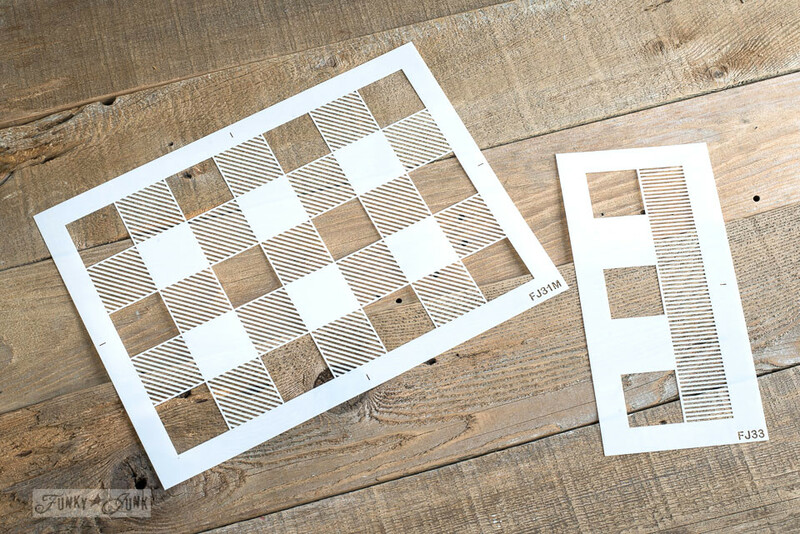 Buffalo Check is now officially a stencil, so you can get this iconic look on anything you desire! Just wait until you allow your creative mind to wander. 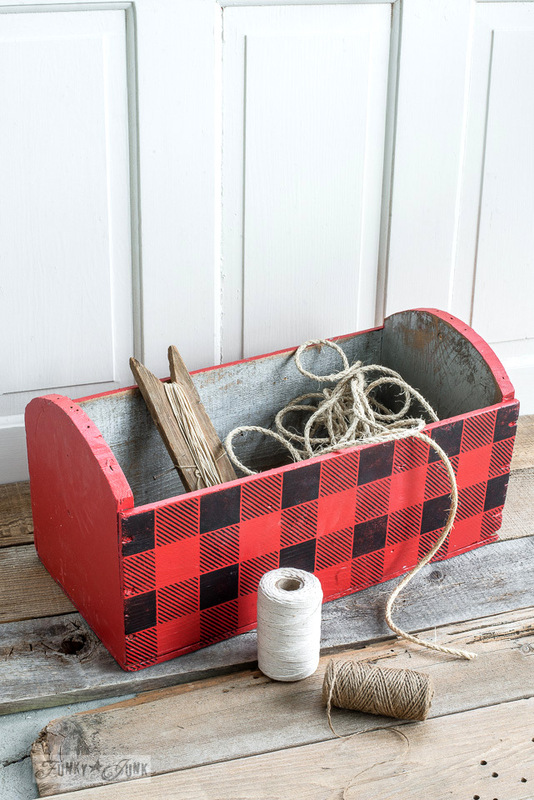 You will want to pattern up anything that accepts paint! I’d also like to publicly thank my blog buddy Carlene from Organized Clutter for this idea, because it was a good one! 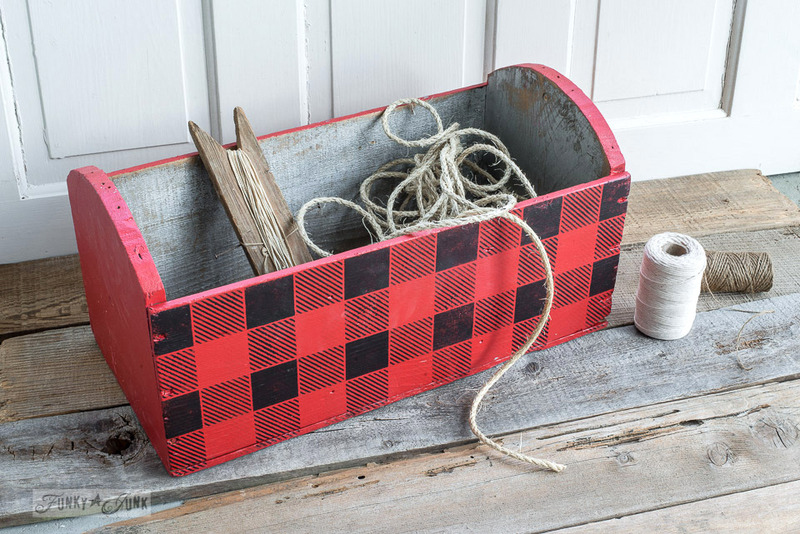 Buffalo Check (shown above with Fringe, sold separately) measures at 10″ x 14″. 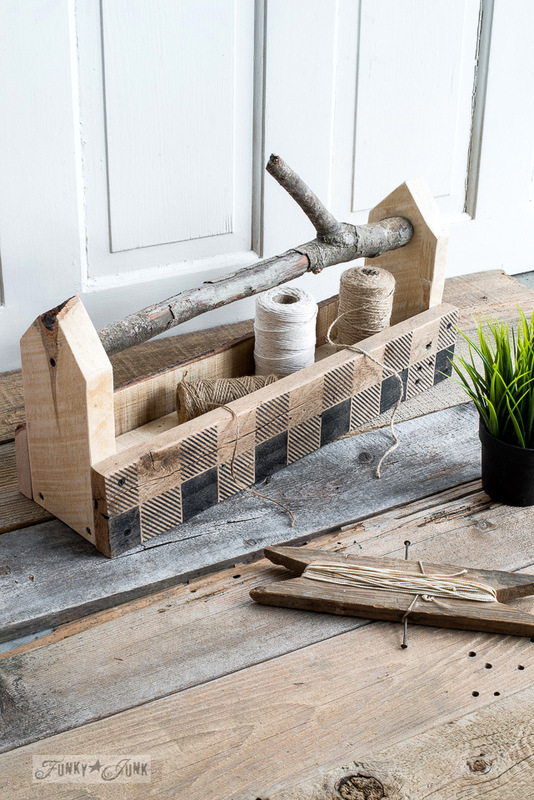 It’s the perfect mid sized pattern for both small and larger projects. 1. 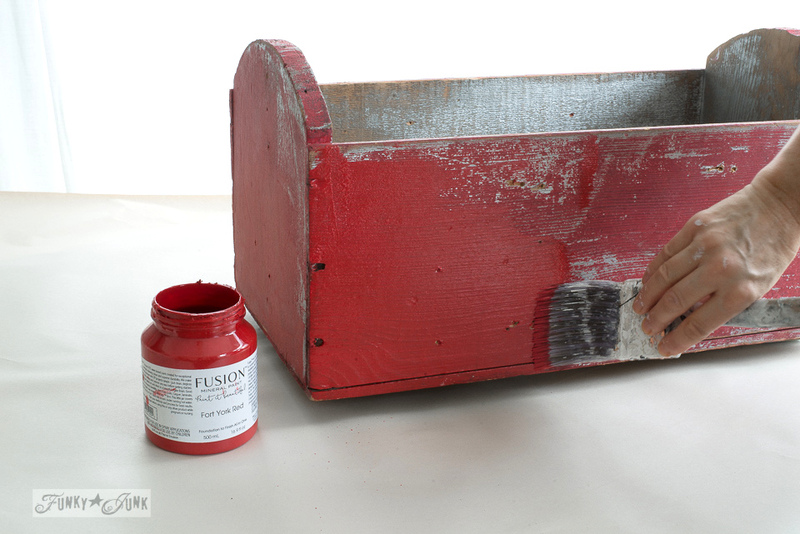 Coat your object with paint of choice. 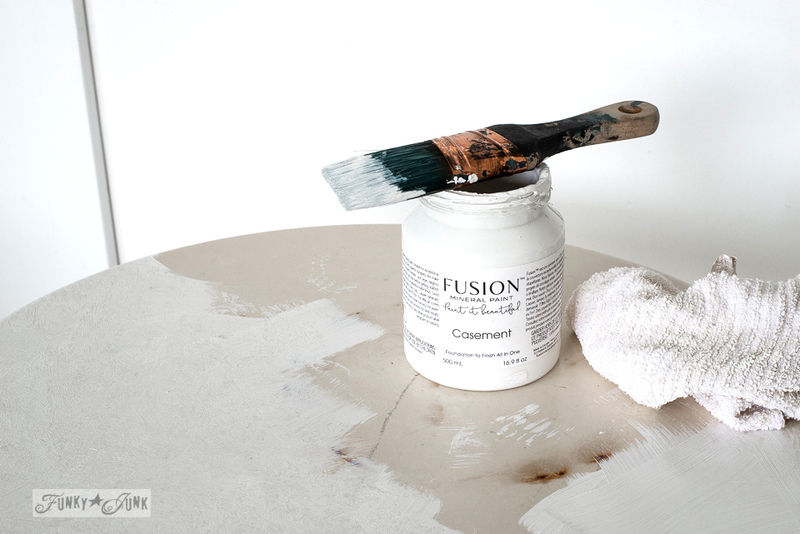 Shown: Fusion Mineral Paint’s Casement, the perfect white. 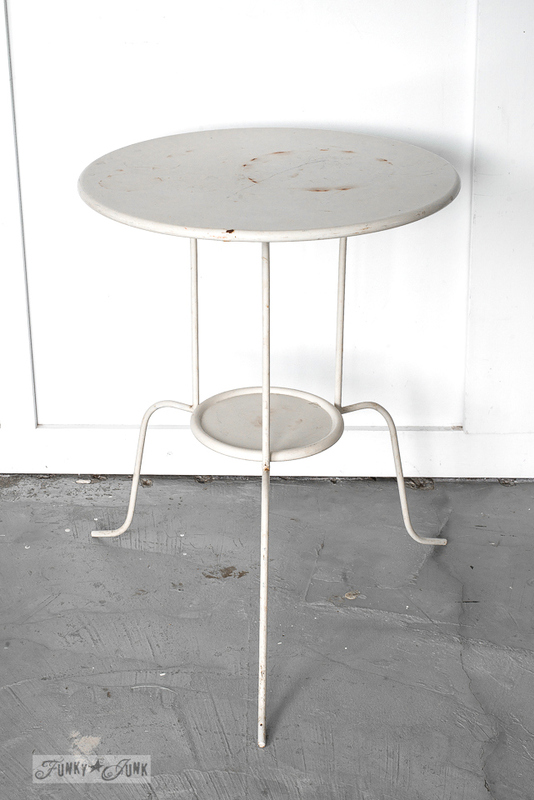 This little metal side table was already white, but needed a refresh. 2 coats of Casement worked perfectly! 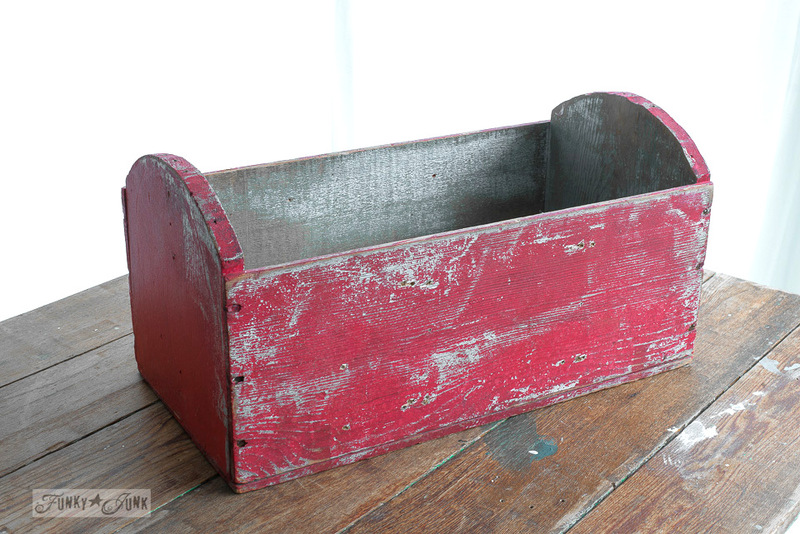 Desiring a more rustic finish, the paint was ‘dabbed’ onto the top to create a stipple effect. It ended up like a powder coated treatment, very cool! Shown: Buffalo Check 10″ x 22″ as shown above has been replaced with 10″ x 14″. 3. Stencil the design with a very dry brush, using a tapping motion. Shown: Fusion Mineral Paint’s Coal Black. 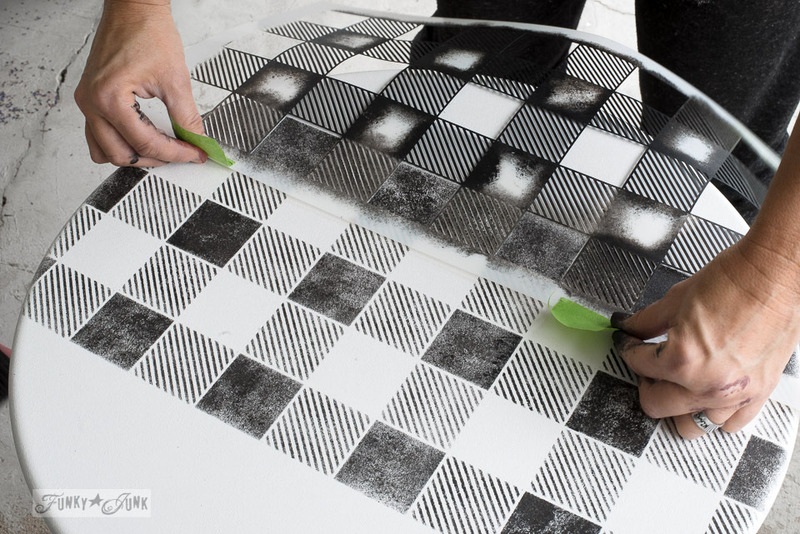 – A larger sized stencil brush (over 1″) works best for a smoother, quicker finish. 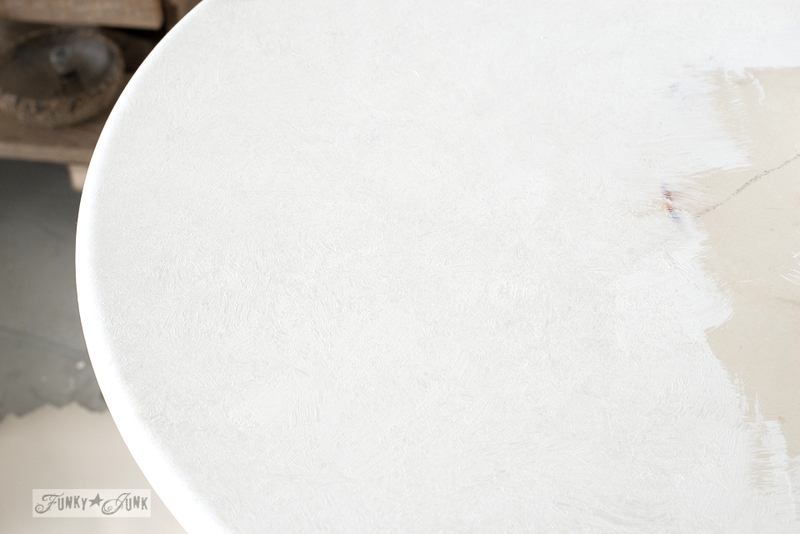 – Load your brush with paint, then remove most of it off again before you begin, in order to create super crisp lines. A dry to the touch brush is key! 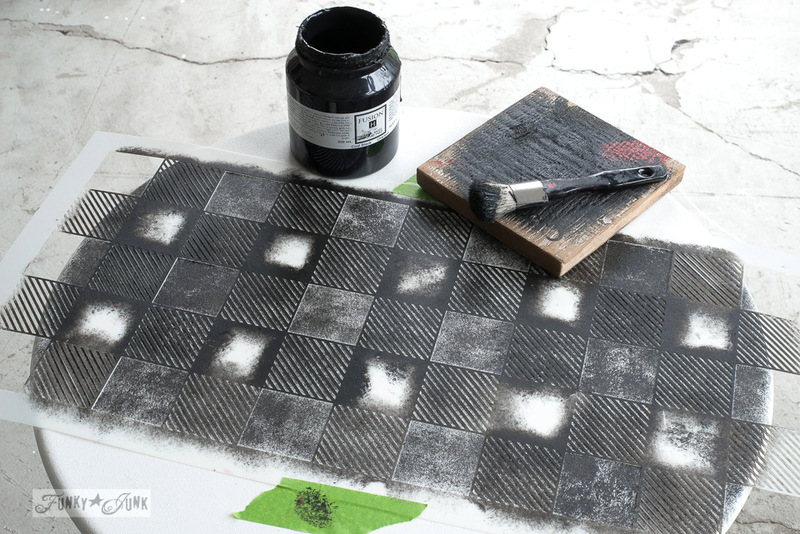 – Walk your fingers along where you are stenciling to help keep the highly detailed stencil into place. 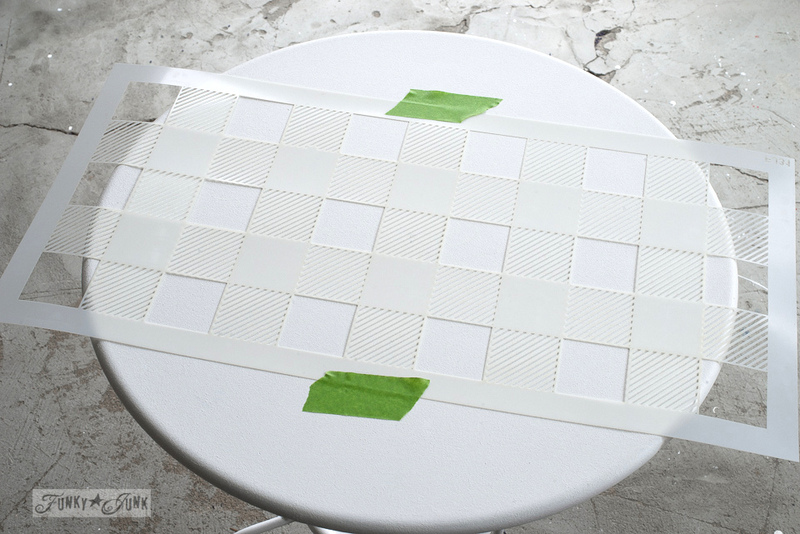 – Tap the paint on starting with the bigger squares first, then transition to the thin lined squares, slightly swiping in the direction of the lines. Your brush MUST be very dry to the touch to do the small lines part. 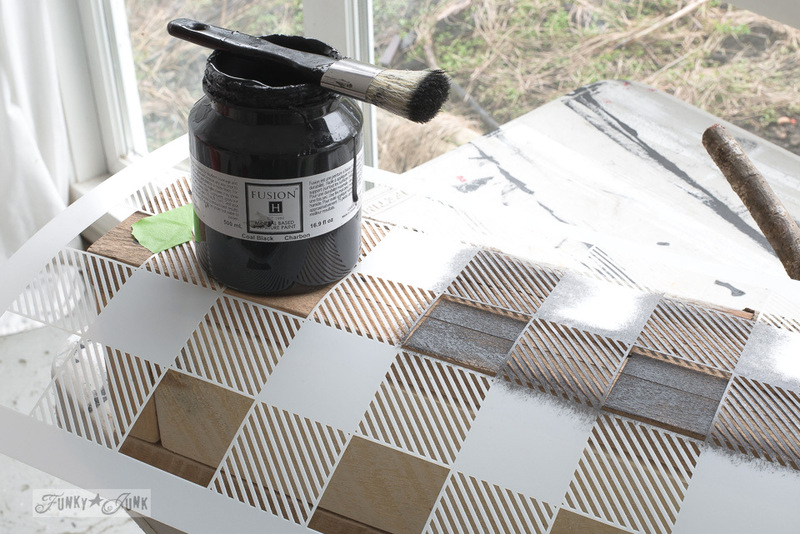 – If you’d like a smoother more transparent effect, wet your brush with water, then dry well prior to stenciling. Try both a dry and wet brush on a test piece to see which you prefer. I love the weathered finish this one took on! You can learn more about how to stencil HERE. 4. Align like minded squares to continue the pattern. 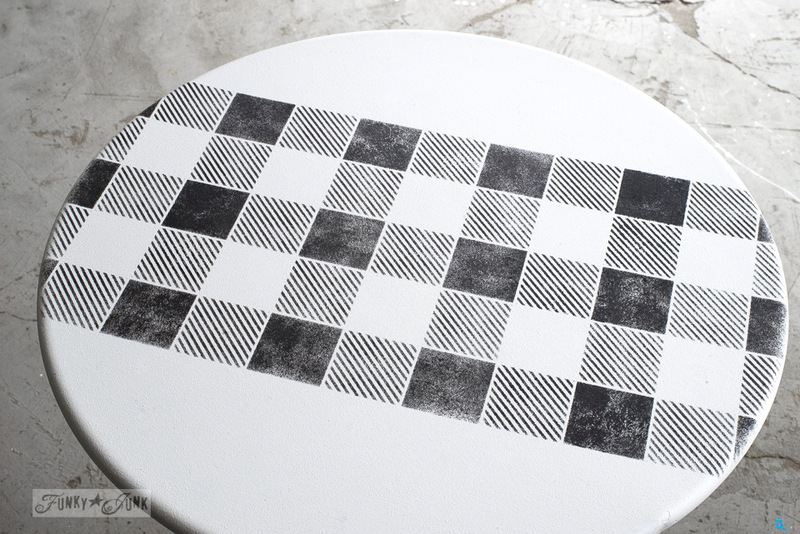 Tip: Make sure your paint is dry to the touch on the back of the stencil AND your table top before continuing. Works pretty slick, doesn’t it?! This look is so fresh and inviting for summery months! For this method, the brush was dampened before adding paint, then swirled on, creating a more transparent look. This iconic look turns out so well, and couldn’t be simpler to create! 1. Coat out your piece in your fav red. 2. 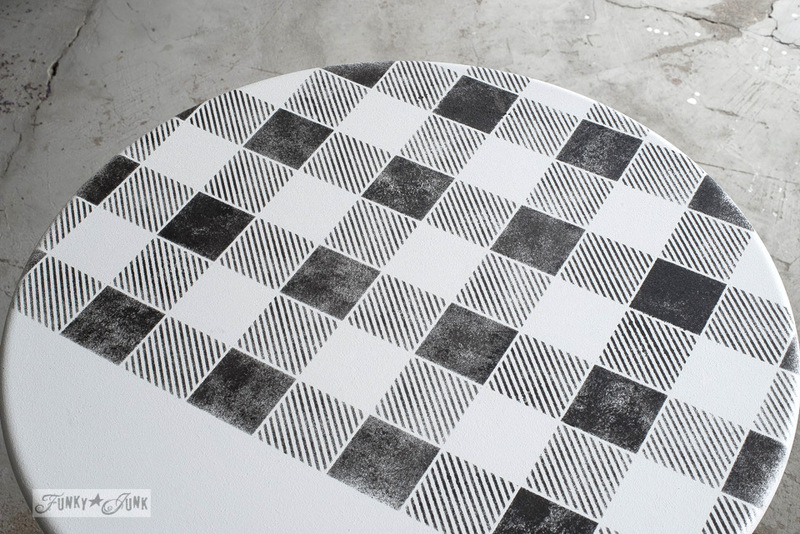 After red is dry, apply the Buffalo Check stencil using black paint. 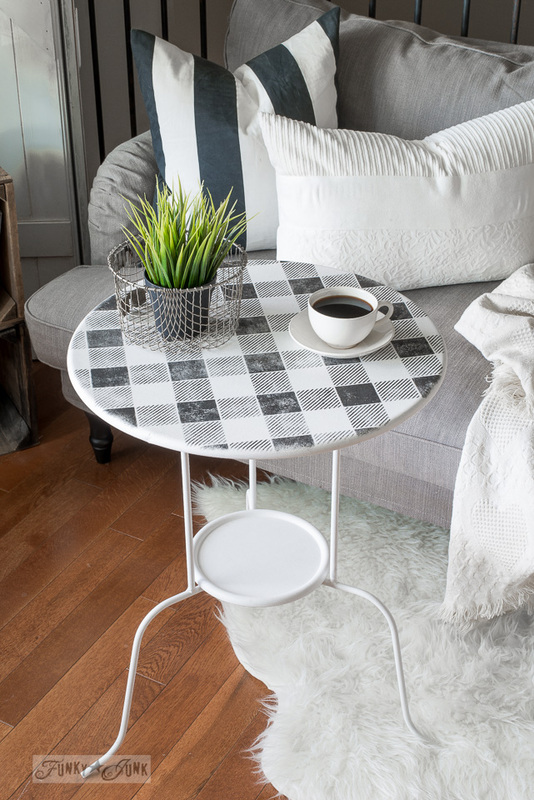 Fringe is a clever little add-on, that offers a fringe styled edge to Buffalo Check. 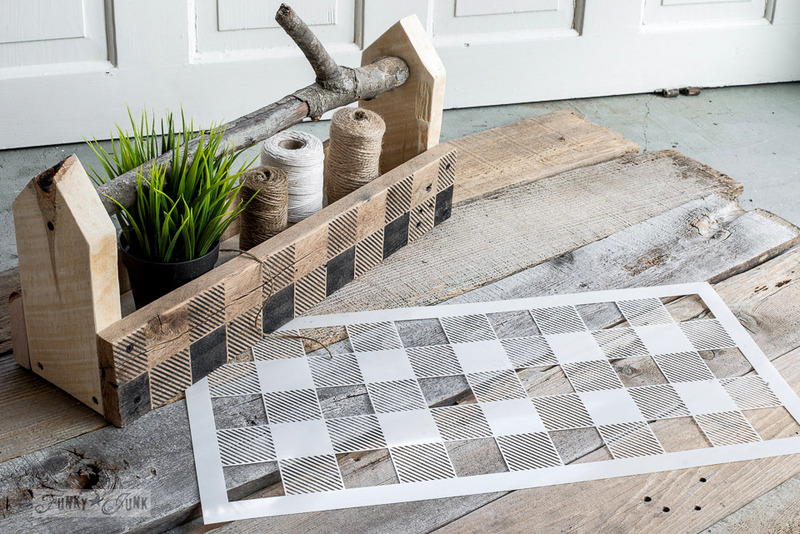 Think table runner, or table cloth. 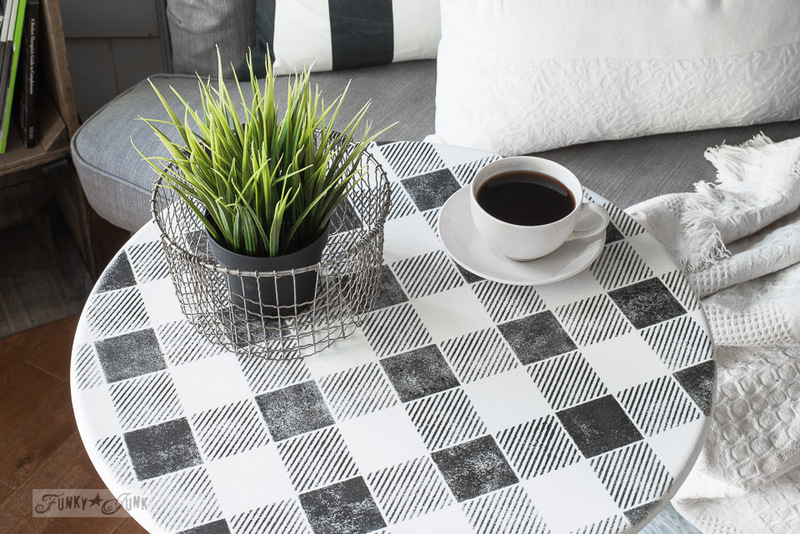 No need to stencil an entire coffee table top, create a runner effect instead! 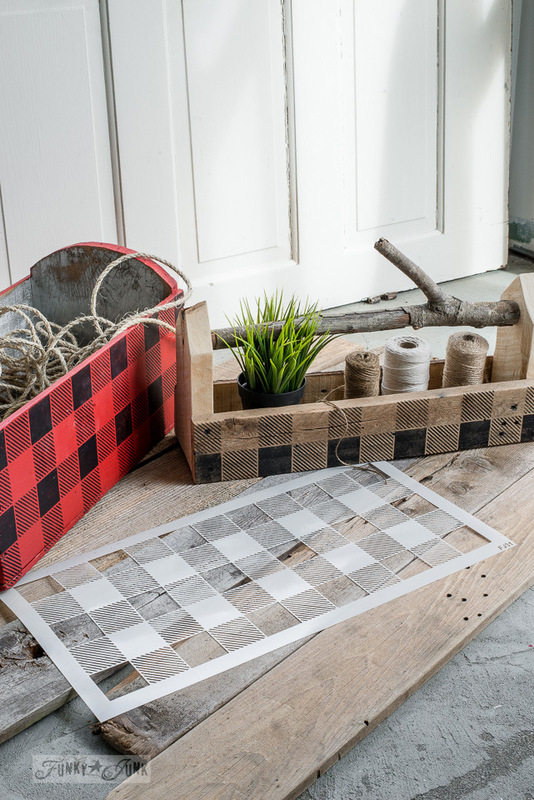 Buffalo Check and Plaid Shirt Bench Mix and Match! 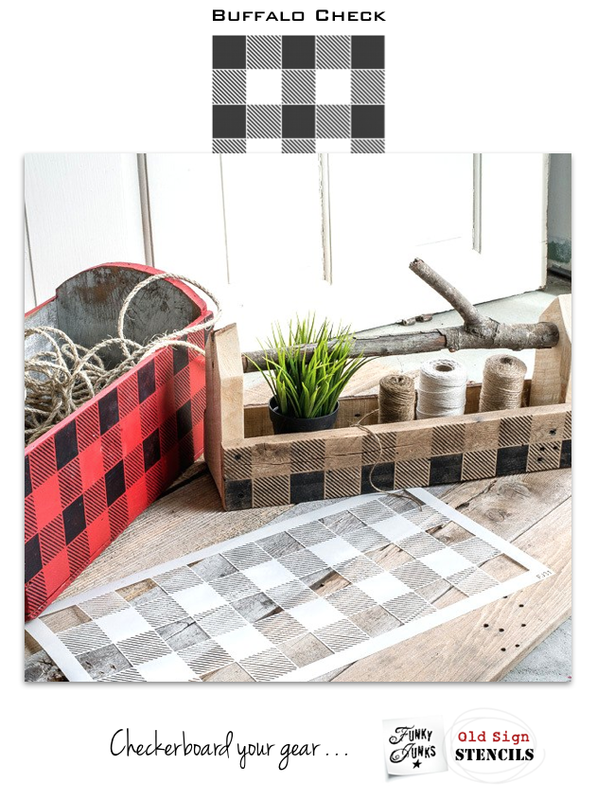 Plaid Shirt (a 2 piece plaid stencil kit) was designed to mix and match with Buffalo Check, so you could achieve even more plaid like designs! And there you have it. 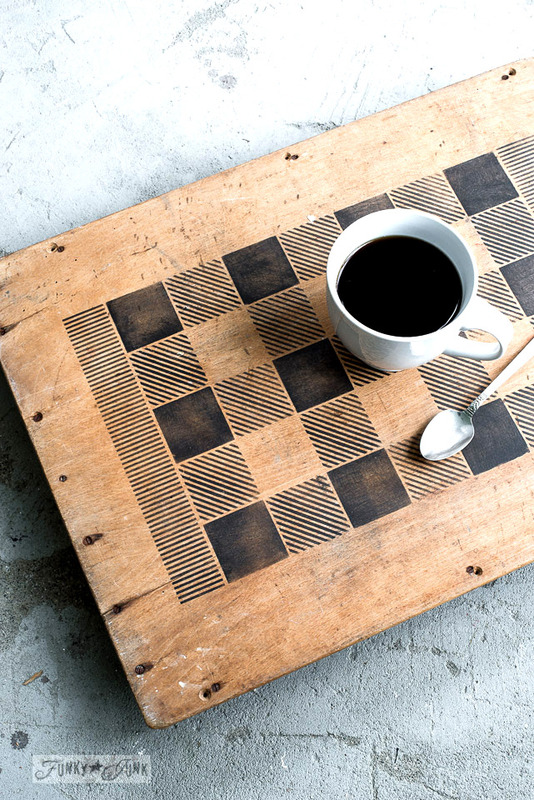 Proof that pattern can marry anything. Spying anything in your home you could enhance with these looks? Oh goodness Sarah, you have no idea how long this took to develop! I have to thank Carlene via Organized Clutter for the idea. Cuz it was a good one! Glad you like! I will legit thank Carlene, LOL!! Just shared it on my page, and clearly I’m not the only one who loves it. Oh Donna, I just LOVE that Buffalo check stencil! 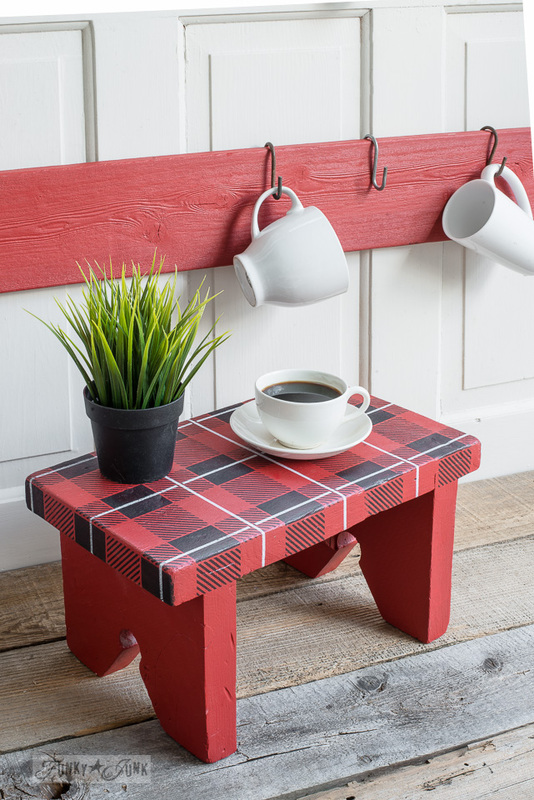 Especially on the little red stool! You’re kidding me with this, right!? OH SNAP!! This might be my favorite stencil YET!! The possibilities are ENDLESS!! I can’t wait to see what you do with this. 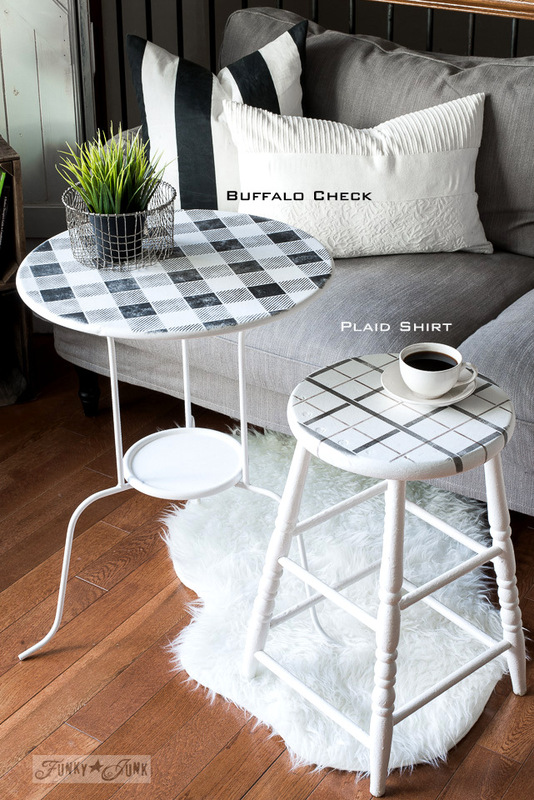 The Buffalo check table is adorable. Great job! Oh wow! 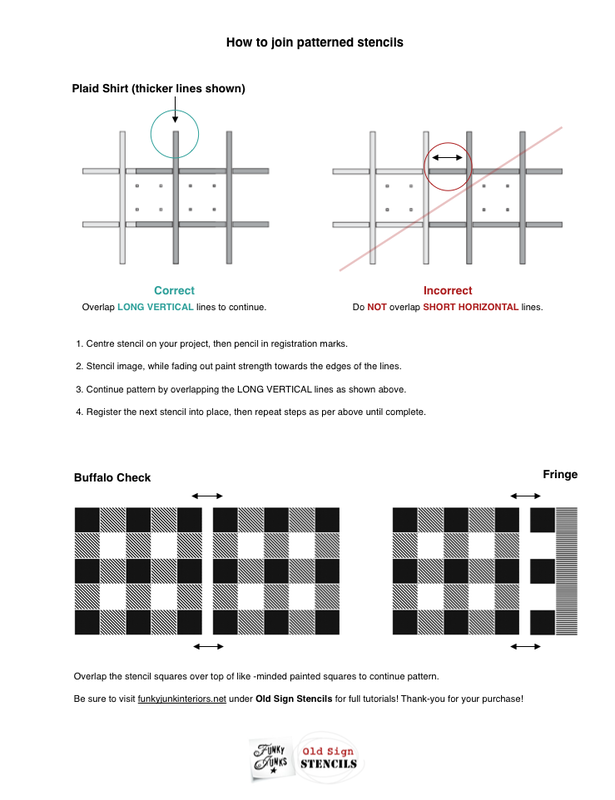 Buffalo check is one of my favorite patterns. Great job. Donna, I am so excited to try these! You did real GOOD! Donna, I love how true you stay to your soul. You spend your time on projects that fit you. That’s so special. Is the red wood from the barn? Hey Kathy! Everything in this post was painted. I haven’t yet played with the red barn wood. But at least it’s now pressure washed and nails finally removed! Getting there… And thanks for the very kind words! Seriously?! Buffalo check is my favourite! Anything I see with this pattern, I buy. Now I can make my own stuff! Thanks for this!! **The number of exclamation points in four sentences is truly indicative of my level of excitement. Buffalo Plaid . . . I flippin LOVE this . . . okay, now I have to find something to do this on.